First of all I have to apologise that this blog has been untended for almost a year. Wetherspoon have opened their newly refurbished premises in St Thomas Street. The premises look good and the designers have done a very nice job. The fifties feel of the place has been preserved in place. They have kept the great Festival of Britain style of electrolier and some of the chairs on the ground floor appear to be the real thing – original retro. Snobbish Lymington seems to have done a volte face as to their attitudes towards a Wetherspoon in the town -there is much, possibly grudging, approval. 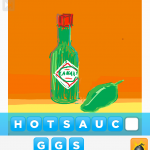 In the last year I have acquired another unhealthy addiction, Draw Something. 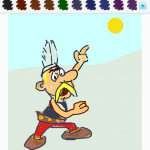 Having purchased an iPad my friend Jane insisted that I obtain this app called Draw Something so that i could play with her. At the time she was already playing the game with her sister in law in Houston, Texas. Well we now play almost everyday all of us being childishly stupefied by this wonderful time waster. 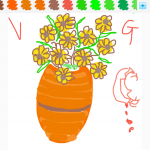 Below I will add some of our better artworks on Draw Something. 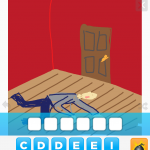 This entry was posted in Inanimate Objects. Bookmark the permalink.